Once Maui, the wind-controller, had every wind, except for one. So he shut the others in a cave, to keep them from blowing, and went searching. His plan was to imprison them all together, and to block up the entrance with stones. But he never, ever, caught the wild west wind. Yet it is on this wind, never tamed, that toroa glide. Soaring above the raging seas of the sub-Antarctic ocean, making only slight movements at elbow and wrist. One of the largest flying birds, one of the greatest wingspans, one of the longest lived. 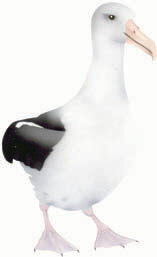 The royal albatross. Returning to us from now on. Landing on the rocks of Tairoa Heads (off Dunedin), they come here to their only mainland breeding colony, and to some small islands in the deep south. All things draw the same breathe. I align myself with the bird – open my chest and shoulders, right down to my wing-tips – and draw in life. In return for their visit to the mainland, something is asked of us. Since 1937 – when Richdale camped beside the nesting birds – we have guarded their nests both day & night. It’s our responsibility. We have to, if they are to visit us on the mainland. Unwittingly, we introduced invasive alien species – ones that would wipe their colony. It’s a long job. It takes longer for that one white egg to hatch than any other seabird-egg in the world, and then the chick won’t soar for another eight months. The first time it flies, it steps off the edge and soars. The only thing those webbed feet will touch, for the next three years, is sea. Toroa will be back in the air, back on the west wind, back up in the place of their belonging. Suddenly, it’s spring! The wind stirs and birds everywhere are on the wing! Around the trees; along the beach; up the river. There was even karearea, our falcon. Traveling on quick wingbeats, in fast direct flight, swiftly winging its way toward nearby Kapiti Island. As I stood and watched, amazed to see it, it slowed in flight, and turned for a moment. Showing me its outstretched wings. Then it was off again. Karearea: the high flier. Fearless. Swift. Accurate & deadly. 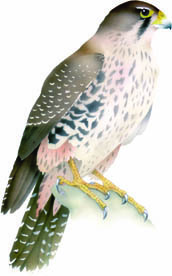 Our falcons are so fierce, so unafraid, they will even attack kahu, the harrier (itself a hunter and twice their size), by turning over in flight and striking it underneath. Yet their parenting styles couldn’t be more different! The fierce falcon is gentle: the bigger harrier is not. Harrier parents let nature take its course. As their chicks grow, the older ones elbow the younger ones away from the food. So the smaller chicks gradually disappear (or get eaten!). But every falcon chick gets its share. When they’re small, they’re feed bill-to-bill by their mother. She tears up the prey brought by their father, and offers pieces to each chick in turn. Holding out a small piece of liver or breast, her head held so that the chick can easily see the titbit, she waits until the chick has quite finished, before offering the next piece. In my family fierceness & gentleness were considered opposites. I needed to toughen up or I wouldn’t survive! Yet both qualities are within this bird. Like the spring egg, they contain these opposites. Ready to be born. As you enter our bush, it is piwakawaka, the fantail, who comes to greet you. Their chattering voice is an invitation onto Tane’s marae: ti-ti-ti, ti-ti-ti. Sometimes too, this bird crosses with a message into our waking world. This has happened to me twice: once in a cave, once in a house. The first time I was living in Kawhia, on the west coast of the North Island. I had tucked myself into a sand-cave, under the roots of a giant pohutukawa, and I was crying. Suddenly, there was piwakawaka, laughing at me! Dancing in front of my face, it twittered & twisted from side to side. On and on it chattered, until I got the message, stopped crying, and joined in. The second time, the bird didn’t laugh – but cried. I was still on the west coast, but further south (in a place where I’d never seen the bird) when it entered a bedroom. The bird beat itself on the glass, wings spread and fluttering, and cried. I opened every window for it to escape, but it would not. Then, when I sat and gave thanks for my teacher – who had just died – it left of its own accord. The bird had come to honour a man who taught me to look for the Christ light (white/heart energy) within the earth herself. So why does piwakawaka dance and chatter so? Because it is one of the forms of Maui, the trickster. In the story, Mauipotiki (the youngest) was once again left behind by his brothers. They absolutely refused to take him fishing. Maui did not like it! Determined that he would go too, he changed himself into a piwakawaka. Then he flew out over the ocean, following them. Arriving at their canoe, he danced in front of their faces. Then he perched on a seat, and shed his feathers one-by-one, until finally he was Maui. Still laughing, still chattering. As it does: ti-ti-ti, ti-ti-ti. Good games provide rich learning systems. Players need emotional flexibility, social complexity, critical thinking, decision-making & cognitive skills, and strategies & processes. Our relationship with the earth – Papatuanuku – our mother, is never one-sided. She cares for us: we care for her. Because we brought the change on these islands, it is up to us to find a new balance with the forces of nature deep within the land. There are no hard and fast rules about how to do this. As in the game – for better or for worse – we make decisions, we try strategies, we co-operate, we do deals. For we are the kaitiaki (guardians) for our birds. In the game, the goddess Hine nui te Po, watches over the extinct birds. In the underworld, she holds the memories of those who have passed from the world of light (Te Ao), forever going to the world of darkness (Te Po). Many birds now remain in her realm. This is a change we wrought. We cannot go back in time. We are here now, and we must look to the well-being of our mother, if we are to flourish as well. Life, too, is a rich learning system. Just like the game! For thousands of years in isolated New Zealand / Aotearoa, there were no rodents, cats, foxes, dogs, bears, marsupials, or snakes. . . our birds became long-lived, slow breeding, large, flightless, camouflaged and fearless of mammals. Around 1280AD, everything changed. Then started two waves of human colonization – one Polynesian and one European – that swept the birds before them. Moa and some other birds were hunted to extinction within about 150 years of human settlement. Each rat found a special place here. What birds did they eat? Of Forest, Sea, Settlement or Extinct? KIORE: arrived with the Polynesian settlers about 1280AD. Once thought largely harmless & vegetarian, in fact caused many historical extinctions. So in the game, they eat many EXTINCT birds, plus a few others. NORWAY RAT: arrived late 18th century. Live mainly in cities and near rivers and the coast. Can swim 2km in open sea – so are most likely rat species to arrive on islands. Eat some EXTINCT, and some SEA birds. SHIP RAT: arrived about 1830. Prey on more forest birds than any other pest mammal, due to widespread distribution & superb climbing ability. Eat many FOREST, EXTINCT & SETTLEMENT birds. They can really wipe out your hand! Still today, every year, mammalian predators kill millions of our native & introduced birds. Our main conservation effort is to avert the damage. Information from the book that comes with the game, complied by John Innes. We are alive on a most astonishing planet. But sometimes we just don’t see it. How do we get to recognize what’s happening in the world around us? It’s not easy. In their book The Big Picture: Reflections on Science, Humanity, and a Quickly Changing Planet (2009) David Suzuki & Dave Taylor report on the following experiment. Researchers at the University of Cambridge…asked 109 British schoolchildren (boys & girls) to identify creatures depicted on a series of 20 flashcards. Ten cards depicted common British plants and wildlife – things like rabbits, badgers and oak trees. The other ten cards showed Pokemon characters. The researchers discovered that at the age of four, children could identify about 30% of wildlife and a handful of Pokemon. But by the age of eight, children were identifying nearly 80% of Pokemon and barely half the wildlife species. Below are 3 rats. What are their names & where do they do the most damage to our ecology (pick one): to the forest birds; to the sea birds; to the settlement birds; or to the extinct birds. If you’ve been playing our card game – you’ll already have seen them in action. Otherwise, answers in next week’s blog. From Sept 21 – Nov 11, there will be an exhibition of Morgan’s illustrations for the game at Expressions Gallery in Upper Hutt. I’ll be there in the school holidays teaching the game (Thurs 4 & 11 Oct), and after that visiting some local schools. Here’s my statement, about the game, for the exhibition. Let me know what you think! Does this describe the game for you? The card (tarot) deck was an early teaching system, coming to us from medieval times. This is a living tradition. Before everyone could read, stories were laid out in the cards. Known images, laid out in a set pattern, showed how the world folds and unfolds & yet returns to its starting place. Using the rotating pattern of four – from which the world was called into being – this world view reached from the divine infinite to us, the mortals. In this way, knowledge was transformed into understanding. In this game from New Zealand / Aotearoa, the images are birds across the four realms. The pattern is a cloak. And your quest is to take responsibility for all the beings in your care / across your land. On one level you are asked to make a simple cloak. On another level, you are asked to hold these islands safe under your protective wing. As part of your guardianship, as part of your cloak of protection, please consider sharing the game with others. Give it as a gift, play it with friends, share it with family. . .
. . for this is our story, laid out in a pattern that reaches both backwards & forwards in time. For here we are now: always at the beginning. Kakapo ate & ate, grew & grew. Their soft feathers ripened into a sweet smell, until they became the largest parrot on earth. Flying was over! Wings were now to break their fall as they leapt, or for balance as they landed and ran. So now, walking on stout legs, they made tracks to feeding grounds and bowls. They were parrots of the night. Sitting inside a bowl of earth, inflated into a feather balloon, the male sent out a love-call. Booming down and across the valleys. Oooom! Oooom! Oooom! If a female arrived, he began to dance. Spreading out his wings like a moth, he waved them slowly. Clicking his beak, he swayed from one foot to another. Approaching her forwards, approaching her backwards. It’s a big job raising kakapo chicks (100+ days). So as get enough food, she only lays her eggs when the podocarp trees or the tussocks are heavy with fruit. She has to do it all on her own – he isn’t any help. He’s too worn out – from that all-night booming! Because kakapo lived long lives (maybe 100+ years) there were always plenty around. Once when you shook a tree in the daytime, sleepy kakapo rained down on the ground! That was when their only hunter was hokioi, the giant eagle. But by 1995 they were called the living dead. Only 51 birds were left. And by 1999, they were all gone from the mainland. Now they only survive, where humans have put them, on 2 predator free islands: Codfish & Anchor. Our scientists have fought for every last one. Every nest, every egg, every nestling. Guarding them day and night. All because now they are hunted by cat, stoat and ferret. Their eggs are even small enough to be easily opened by kiore. It’s strange, but big kakapo (male 2.5kg, female 2kg) don’t know how to fight back – unless (of course) it is the males fighting each other! Their camouflage colours don’t hide them, and their sound and strong scent gave them away. Kakapo lived here for millions of years. One day – we dream – they will return to the mainland. That they will be safe here, once more, to eat & eat, grow & grow. 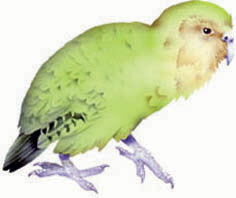 In the game, Cloak of Protection, kakapo is one of the birds you need to make a cloak of forest feathers. But – watch out – hokioi, kiore, ferret, cat and stoat stalk them.